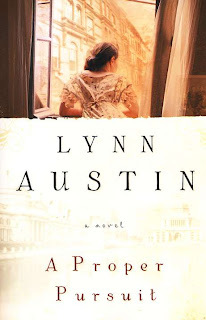 I picked up another book by Lynn Austen and reviewed it over here at 5 Minutes for Books. You can read my more complete thoughts over there. The main message that I took away from this book, through the starkly different characters that Austin presents us with, can be found in 1 Corinthians 12 in which we are clearly told that we do not all have the same gifts and talents. We are created to be unique individuals with strengths and weaknesses that God uses for His glory. Some people (like myself) have more of a strong personality and some others are far more easy going. We dedicate ourselves to the body and to Christ in different ways. Lynn Austin definitely prompts you to think through various personalities and opinions about "the way things should be." Although I do not admire the main character in this particular story her pliability, I did find the other characters in the story interesting and rewarding as they seemed to be the driving force behind who Violet ultimately becomes in this story. On the whole, I'd recommend this book. I wouldn't mind trying another of Austin's books as well.